Every dental practice wants to provide excellent patient experiences, build relationships, and maximize the overall performance and efficiency of their practice. The key to achieving this is through effective, timely, relevant patient communications. In order to be successful, communications must contain the perfect blend of timing and messaging. The more a message resonates with patients, the better the engagement and response rates will be. 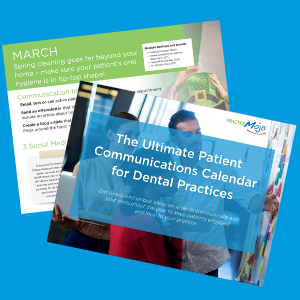 That’s why we created the ultimate patient communications calendar for dental practices. We’ve done the legwork for you, giving you tools and ideas on what to communicate to patients each and every month. Get your free copy today to save time when it comes to communicating and growing relationships with patients. Get Your FREE Patient Communications Calendar Today!